Question: how do you revitalize an epic but exhausted toy line? Answer: dig up a lesser known superhero from the 1940s, steal the idea, and add him to the GI Joe line! 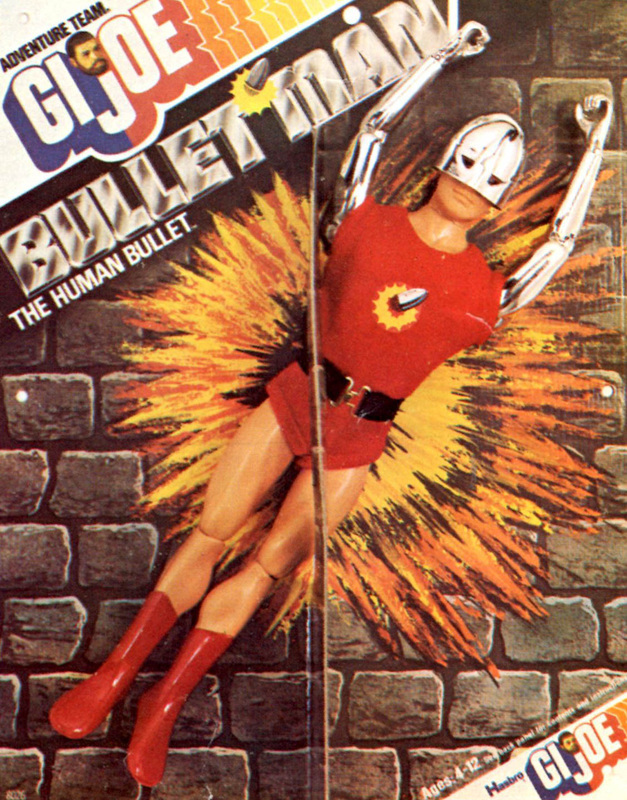 Bullet Man, the Human Bullet (8026) is an oddity either ignored or fanatically loved by GI Joe collectors. With his chromed helmet and arms and always stylish singlet he is ready to aid the Adventure Team in their battle against the Intruders. Unlike the other figures in the late-issue life-like body line, Bullet Man has older style hard hands because the rubbery Kung Fu Grip hands couldn't be chromed. He came with a nylon line that can be threaded through the eyelets to make him 'fly.' The British issue Palitoy version comes with cool rockets attached to the boots, a design element Hasbro left out. Carded version below courtesy of a private collection. Below left, the Sears box for Bulletman, courtesy of Joezeta. See his auctions here! Below, an image of a prototype Bulletman from from the 1976 Hasbro GI Joe Club magazine. Note the chromed KFG hands.